This month marks the official opening of the much anticipated Agam Museum in Rishon LeZion, Israel. David Nofar's 3200 square meter spacious building dedicated to the work of Yaacov Agam is well worth the wait. From the moment visitors step onto the grounds of the museum they are engulfed into the rainbow world of Agam. 'The Pillars of Clilla,' named for his late wife, includes 29 monumental columns (20 at the entrance and 9 inside the building) which make the distinction between indoors and outdoors inconspicuous. 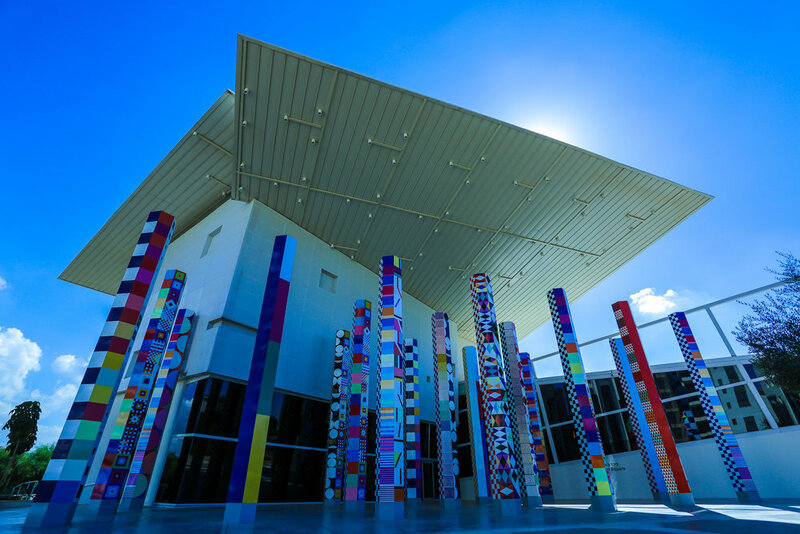 Meeting visitors in the courtyard, these columns transport them into the mind of Agam and lead them into the museum’s central space, which boasts his ‘panorAgam’ work, originally displayed on the bow at the Guggenheim Museum in New York City in 1981. Agam is widely considered the father of kinetic art because of his early preoccupation with time and movement. Kinetic art is defined as art that relies on motion to create its desired effects. Agam’s work is concerned with the what he refers to as ‘the fourth dimension,’ which is the idea that time is visible within the artwork and the piece is not static. This element is broadly explored and thoroughly explained through the myriad of works in various mediums in the museum. In fact, without the active role of visitors the kinetic elements of Agam’s works would not be possible. Viewers cannot remain passive if they are to truly experience Agam’s art as he intended. His work requires you to be active physically, cognitively, and emotionally. This concept is better experienced than explained as the ‘perpetual becoming’ of Agam’s oeuvre reveals itself to viewers within the museum. Agam’s signature style is well known to the Israeli public who would recognize his major works in Tel Aviv: the ‘Water and Fire’ fountain at Tzina Dizengoff Square and the facade of the Dan Hotel on the Tel Aviv Promenade. Yet, his work resonates on an international scale with non-Jewish communities. However, it would be negligent to discuss Agam without acknowledging his connections to Judaism. Born in Rishon LeZion in 1928, in what was then mandate Palestine, to a Kabbalist Rabbi father, spirituality and Torah teachings permeated his youth and stay with him to this day. Judaism forbids figurative artworks and since Agam is restricted in this way he uses abstract figures in his work to express the feelings of life. At 89 years old, Agam is embracing technology and is increasingly interested in applying his artistic principles to new medias. Through computers and applications he has created interactive works that activate the participants senses of touch, sight, and sound. This convergence of the senses breaths a new life into Agam’s work and keeps it relevant in the 21st century.